Shop Gotham Exclusively offers several Self Directed- Self Guided itineraries, which map out a half day itinerary (or longer if you want to be more leisurely) so that you can set off to explore on your own. For a city which changes in a NY minute, this is the uber Cost and Time Efficient program. For Shopping itineraries, the emphasis is on shops and brands you cannot find in your mall, so as to allow guests to bring a little NYC home in their bags. Programs are sent via email and include: the written itinerary in geographic order, relevant details about each shop, a couple of special landmarks to take note of as you are walking And a simple accompanying map. Some itineraries are for a specific geographic area, some are by category and may include several areas of Manhattan. Soho and Nolita is a “customized” program for each guest. Whichever you choose, they will always have up-to-date information. The Downtown Food Sampling itinerary is especially terrific for families and groups of 2-6. We recommend this as a Daytime program and to give yourself(ves) an entire day to enjoy the food and the neighborhoods. Just like the shopping itineraries, you will receive a written itinerary with photos to help the ease of locating each spot, some landmarks to see and an accompanying map. A minimum of 10 days advance request is suggested. Itineraries are sent via email. For Minimum of 3 Women. Ages 20 and older. Appointments in Designer Showrooms AND the exclusive opportunity to buy at WHOLESALE. Handbags, Scarves/Kimonos/Ponchos, “Better Costume Jewelry”. 1.5 – 2 hours. Available Mon- Friday, 9:30am – 5:00pm. WALKING PROGRAM. Bonus: we will provide you with a couple suggested Sample Sales in the area to check out on your own as well. Best for groups of families or friends – who want to make the absolute MOST out of a day in NYC. And have a blast doing so. 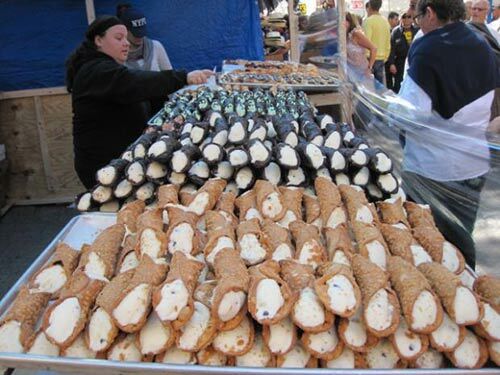 TASTE and EXPLORE your way through 4 neighborhoods: NoLita, SoHo, Little Italy and Chinatown. This Comprehensive itinerary will guide you to 9 delicious spots for small bites, while highlighting interesting landmarks to see as you walk your way to each tasting location. Step by step Directions and Location Photos ensure this as navigationally dummy-proof and fun. Cost-Effective and spectacular way to enjoy these exciting and authentic NYC neighborhoods. Spring is the season for milestone occasions. If you are shopping NYC for that special occasion dress, we have the places for you to nail your perfect item. Traditional, slinky, urban edgy, long and short. A dozen stores throughout Manhattan, to fit all styles and budgets. All store details and Map of locations included. Sample Sale shopping in NYC can be a thrilling adventure. This is the opportunity to score deals on known designer apparel. And Shop Gotham knows what is what and what is where. While sample sales are held all year long, there are specific months when they are Robust. Comprehensive Sample Sales lists are available for: May, June, November, December.